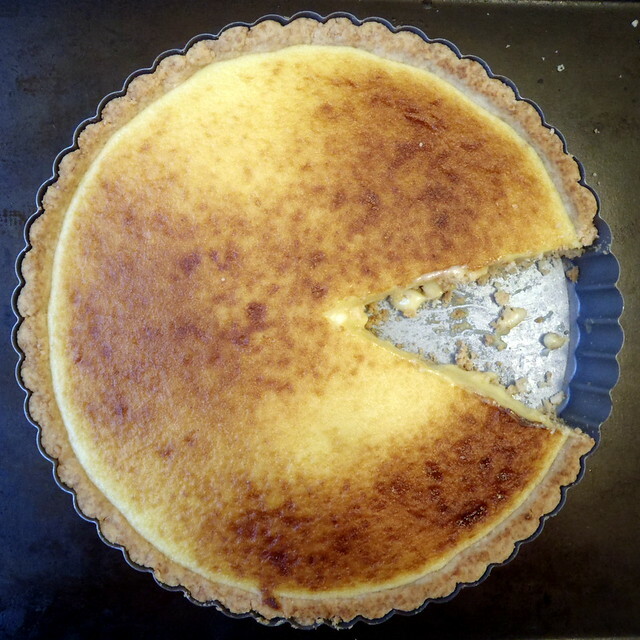 After years and years of not owning a tart pan, I finally bought one, and the first thing I wanted to do was make Thomas Keller's lemon tart. My friend, Ellen, had made one with her family and they had raved about how good the pine nut crust was, so I knew I needed to try it. 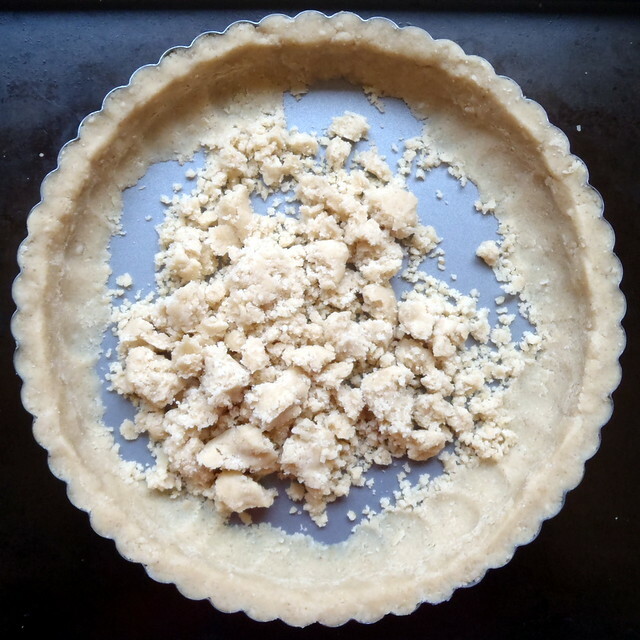 The pine nut crust recipe makes enough for 3 tarts but is hard to divide since it only uses one egg. Go ahead and make the full recipe and keep the leftover dough in the fridge where it will keep for a couple of days or the freezer, where it will keep for a month, because after you taste it, you'll just want to make more. 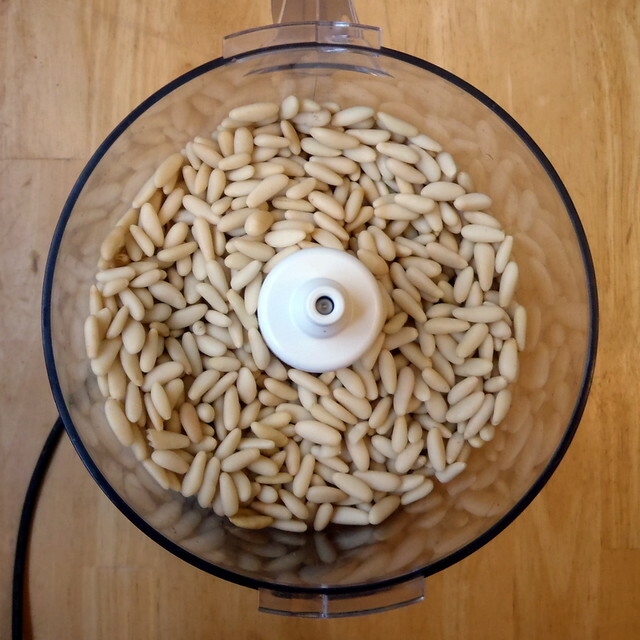 Place the pine nuts in a food processor and pulse a few times. Add the sugar and flour and continue to pulse until the nuts are finely ground. Transfer the mixture to a large bowl. 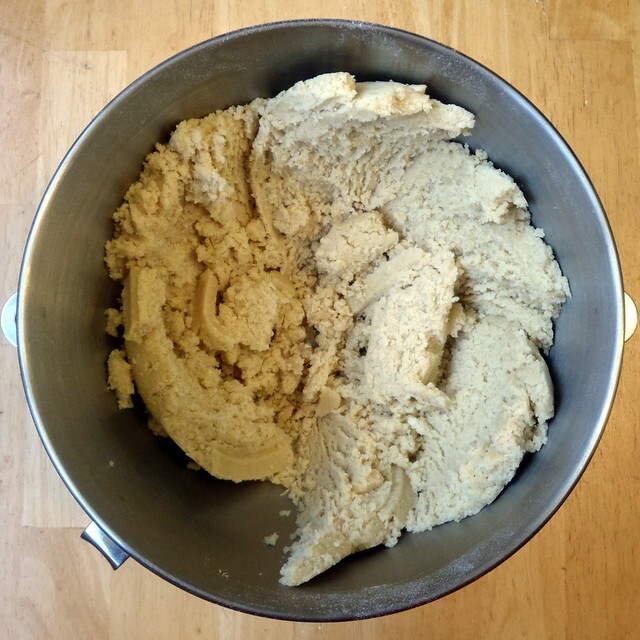 Add the butter, egg, and vanilla extract and mix to incorporate all the ingredients (the dough can be mixed by hand or in a mixer fitted with the paddle attachment). 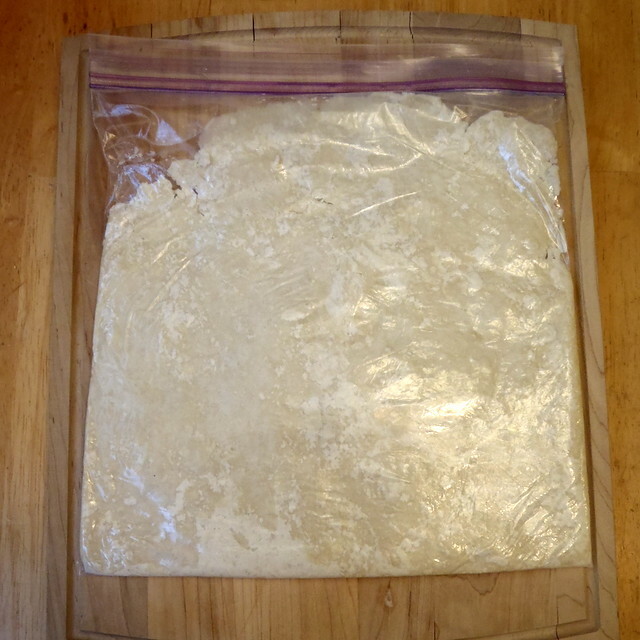 Divide the dough into three equal parts. Wrap each piece in plastic wrap and refrigerate for at least 10 minutes before using. 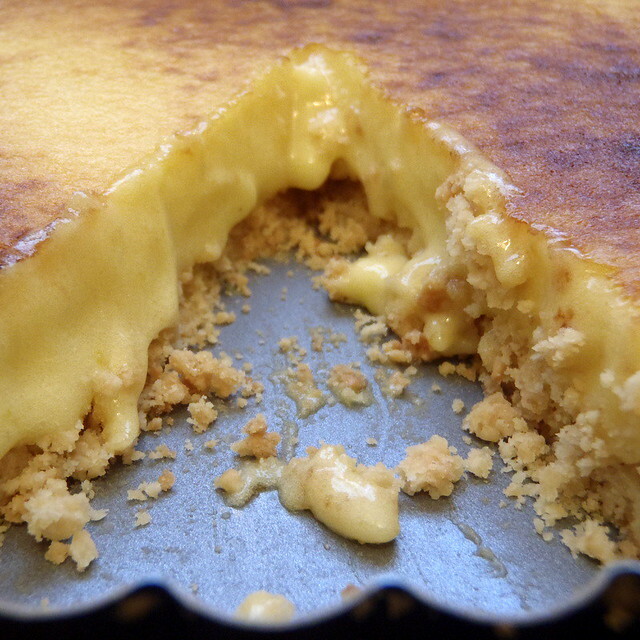 Remove the tart pan from the refrigerator. Use your fingertips to press the chilled pine nut dough evenly over the bottom and up the sides of the pan. I found that the easiest way to do this was to fill in the sides of the pan first, and then press down whatever dough is left into the bottom. That way you don't have to worry about making sure there is enough dough to evenly press into the sides if you started in the middle. 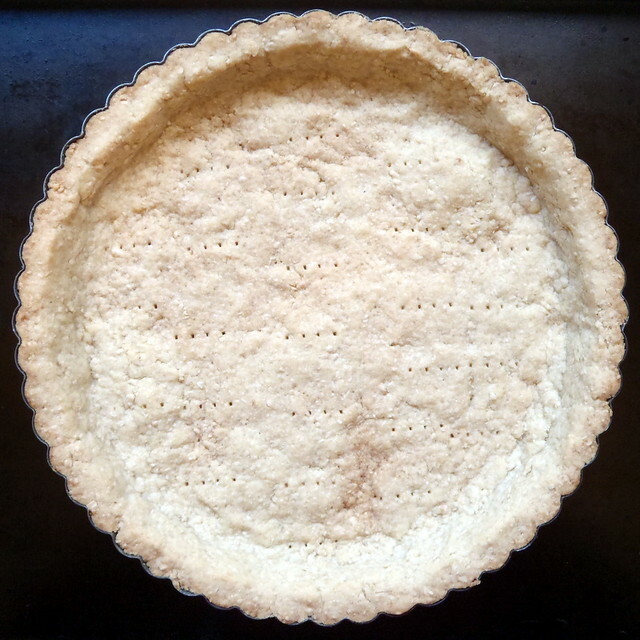 Prick the tart crust with a fork to prevent it from puffing up unevenly. 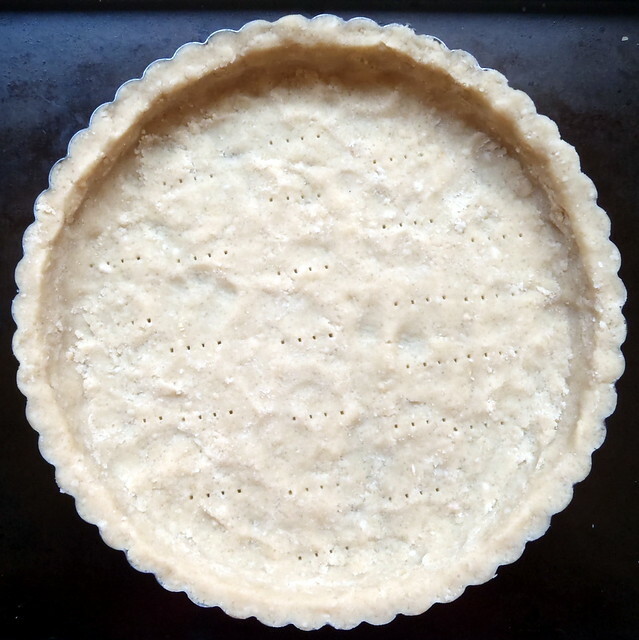 Bake the crust for 10 to 15 minutes, then rotate it and bake for another 10 to 15 minutes, or until it is golden brown. Remove the crust from the oven and let it cool while you make the filling. 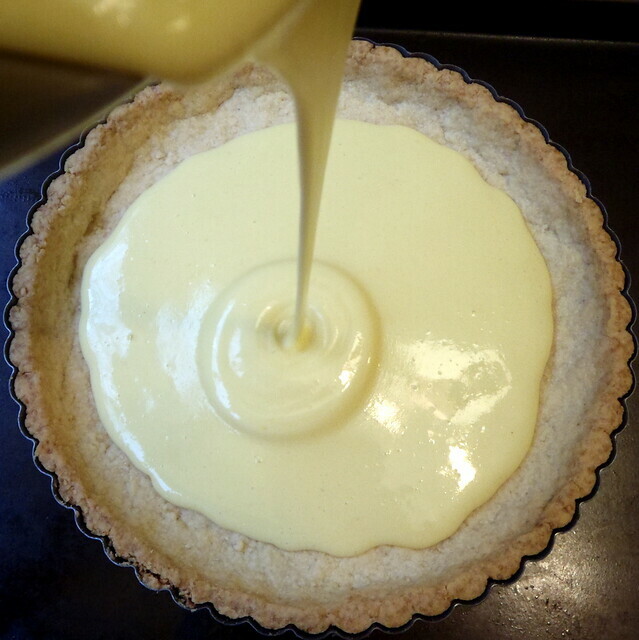 The filling for this lemon tart is made using the sabayon method, which means the eggs, lemon juice, and sugar are first cooked over boiling water and then incorporated with the butter. 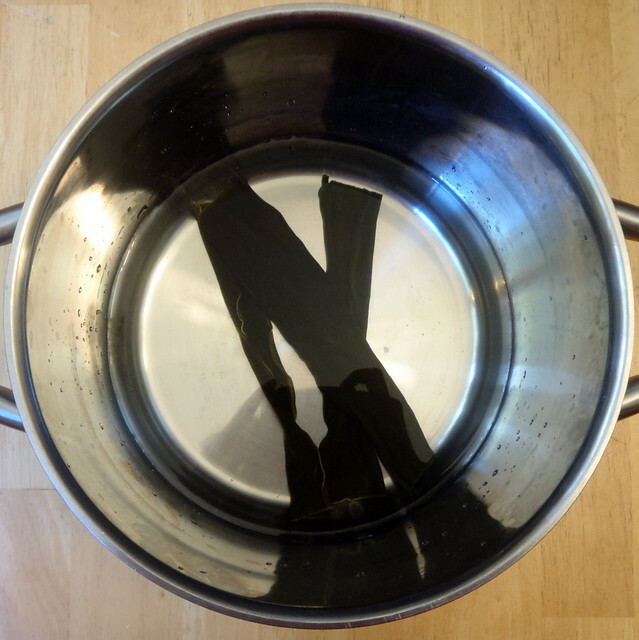 Bring about 1 1/2 inches of water to a boil in a medium pot. 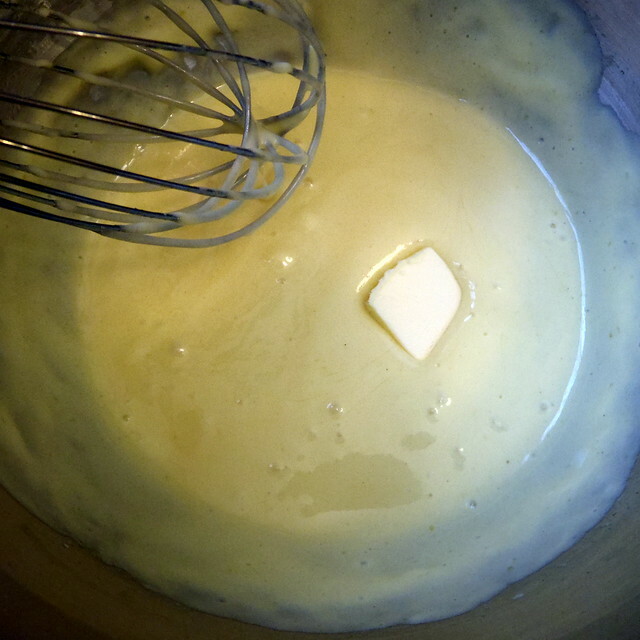 Meanwhile, in a large metal bowl, whisk the eggs, yolks, and sugar for about 1 minute, or until the mixture is smooth. As you can see from the picture above, I didn't do a great job with broiling the top evenly. It would've been a lot easier with one of those mini blowtorches that you use for creme brulee, I think. 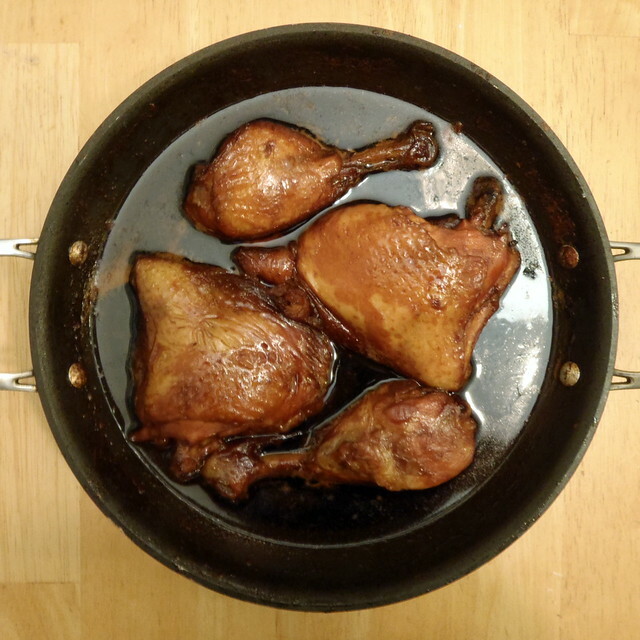 As with all Thomas Keller recipes, this is not simple to make, but delicious to eat. 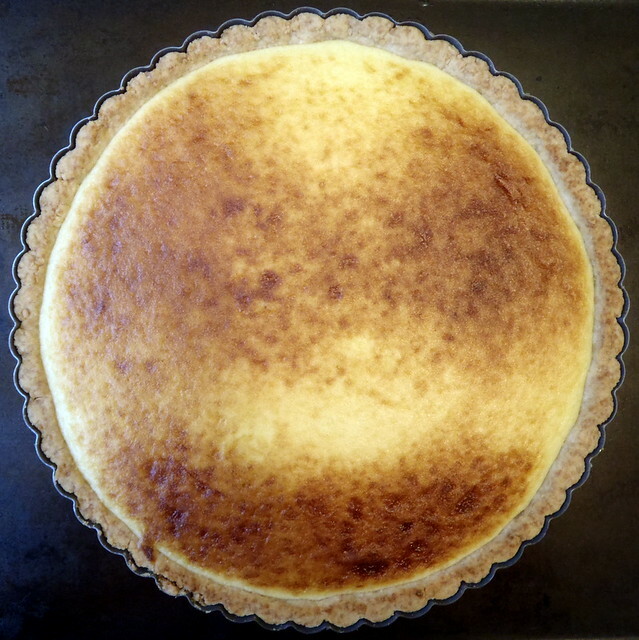 Since I still had enough crust for 2 more tarts, I decided to try a super easy lemon tart recipe next. Tempura udon noodle soup is pretty much my go to order at Japanese restaurants if they don't serve ramen. I love the contrast of the crunchy tempura vegetables with the thick, chewy noodles and the delicate broth that brings it all together. Tempura isn't something I'd normally make at home since deep frying can be such a pain, but being able to eat freshly fried tempura is so good that it's worth it. You can also refrigerate any leftovers and heat them up in the oven or toaster oven, but it won't be as good. Peel and slice the sweet potato into think rounds. Cut the broccoli into florets and discard the stalk. Cut the onion into thin slices. 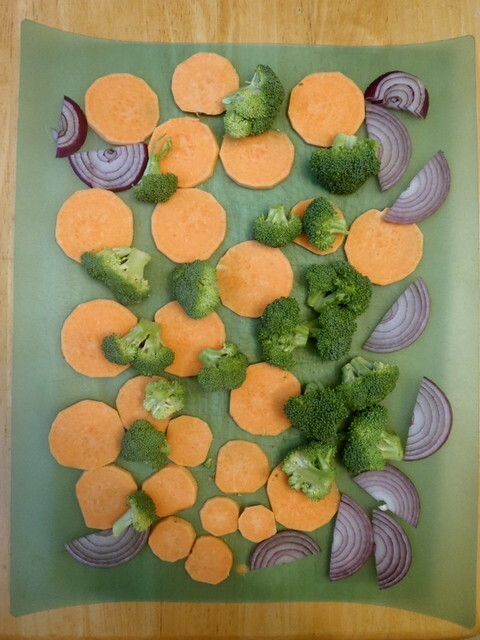 Spread the cut vegetables out and allow to air dry for at least half an hour, flipping the pieces halfway through. 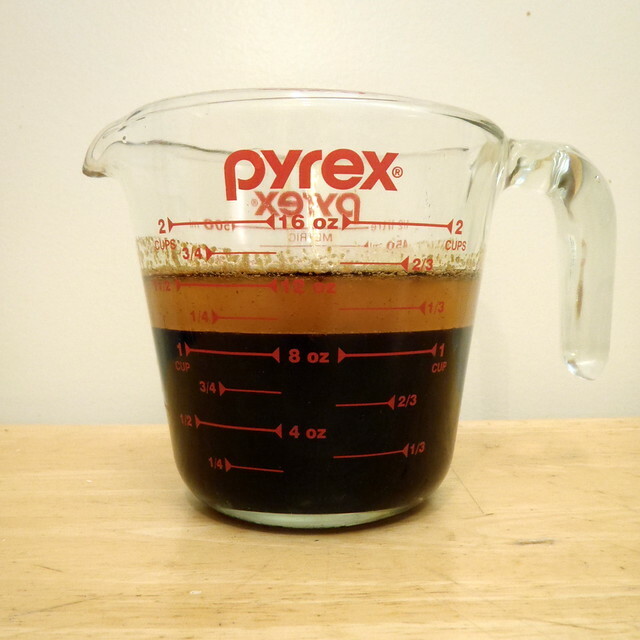 Pour enough oil into a heavy pot so that the oil is at least 2" deep. 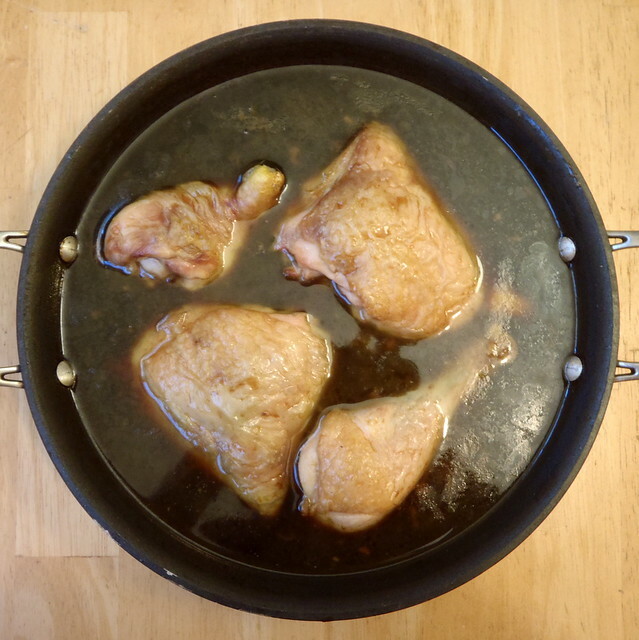 Heat on high until the oil reaches 350°F. 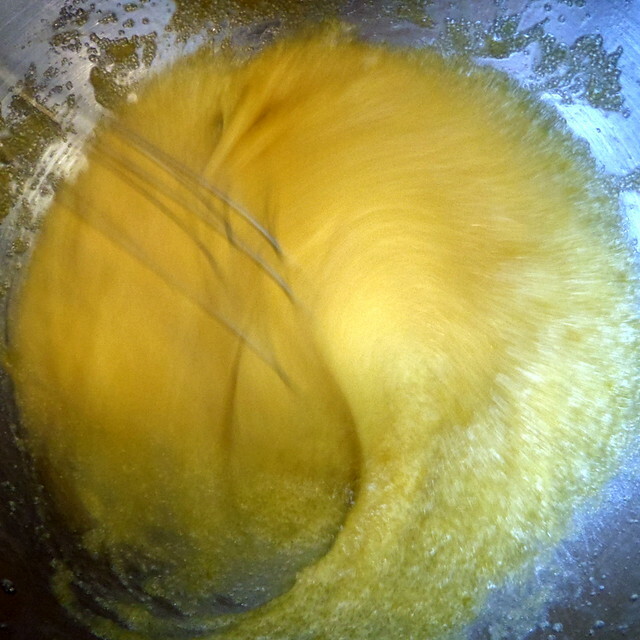 In the meantime, mix the egg yolk, ice water, and flour to make the tempura batter. Prepare a draining rack by lining a baking tray with two layers of paper towels and then laying cooling racks on top of the towels. Once the oil has reached 350°F, drop a few pieces of vegetable in the batter to coat and carefully lower into the oil (I used chopsticks to do this). 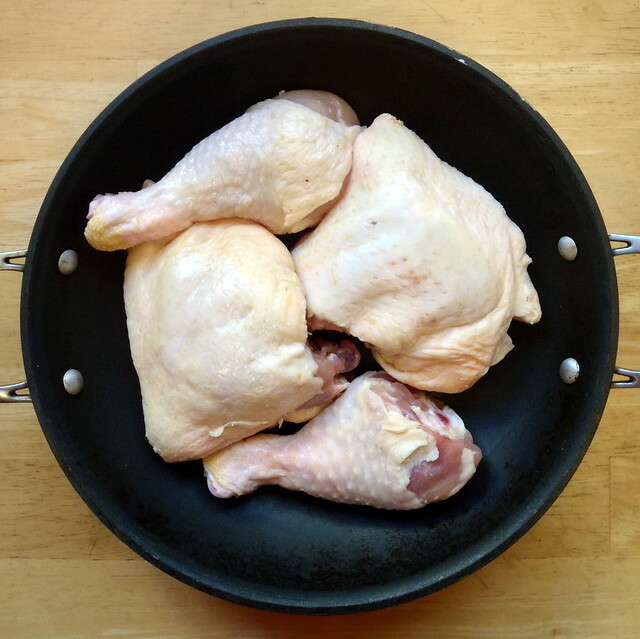 Make sure you do not overcrowd the pot; you don't want the vegetables to touch each other while they're cooking, and you don't want the temperature of the oil to drop too much. When the vegetables have lightly browned, remove with a slotted spoon and place on the draining rack. Make sure the oil has heated back up to 350°F and repeat with the rest of the vegetables in small batches. Serve immediately. 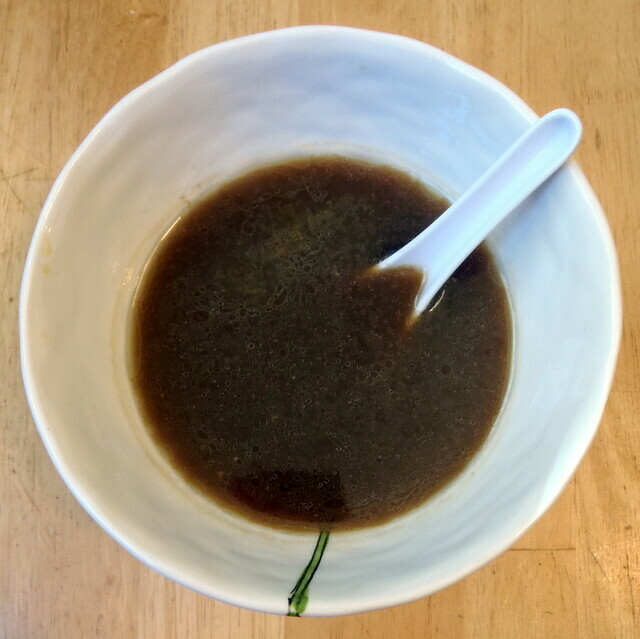 You can make a dipping sauce by mixing one cup of dashi with 1/4 cup mirin and 2 tablespoons of soy sauce. 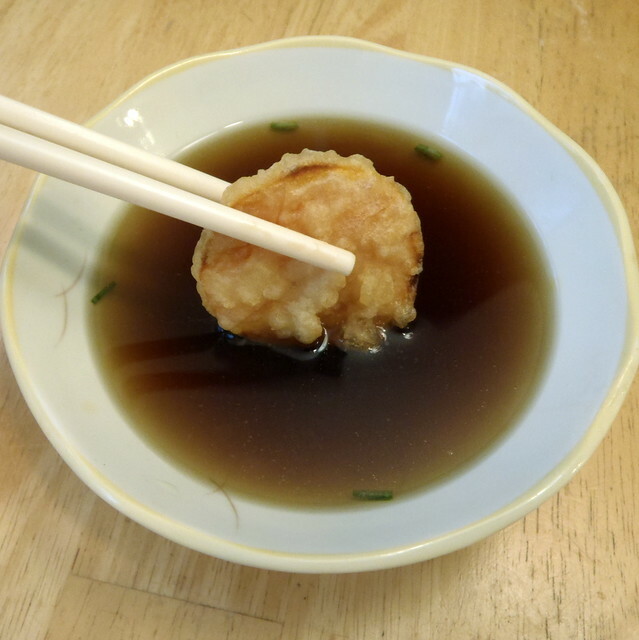 To make tempura udon noodle soup, heat two cups of dashi and add 2 tablespoons of mirin and soy sauce each. 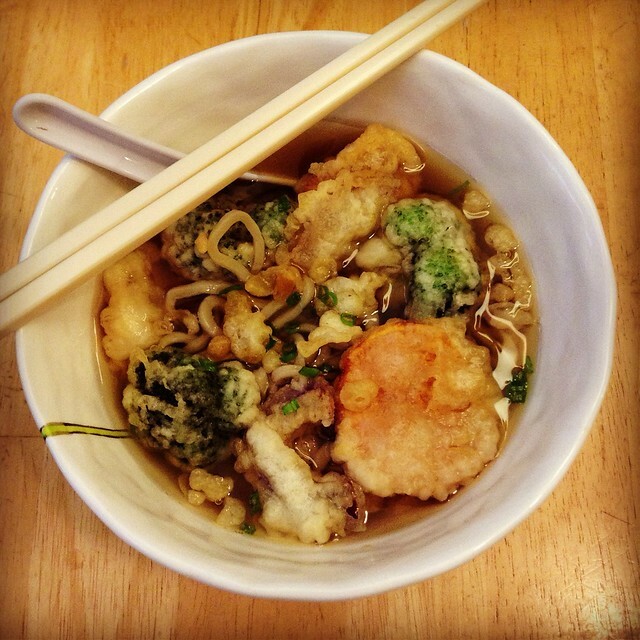 Pour into a large soup bowl, add cooked udon noodles, and top with vegetable tempura. If you end up with leftover batter after frying all the vegetables, drip it into the hot oil to make tenkasu (tempura flakes). I like to add these to the udon noodle soup for added texture. You can also use them in okonomiyaki. 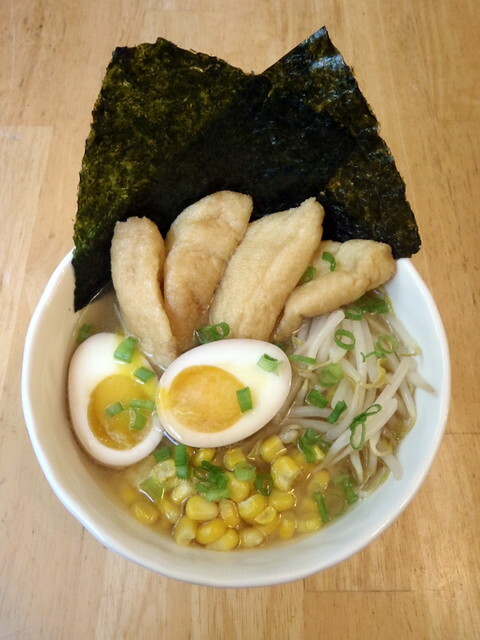 Compared to making ramen noodles, making udon noodles seems a lot less fussy. 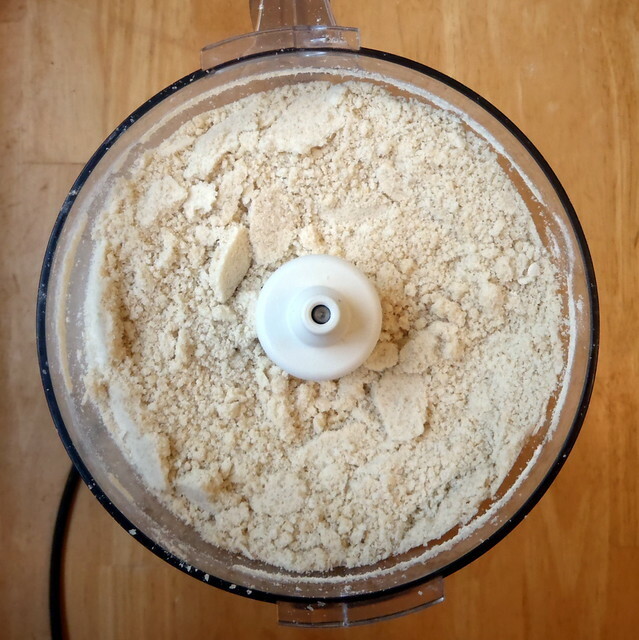 There's no obscure ingredient to find (unless you live somewhere where you can't find tapioca flour) and you literally use your feet to knead the dough. I know! Since the noodles are a thicker cut, there's even less of a need to have a pasta machine as well, although I found the dough to be stiffer so a pasta machine can really help with the rolling part. 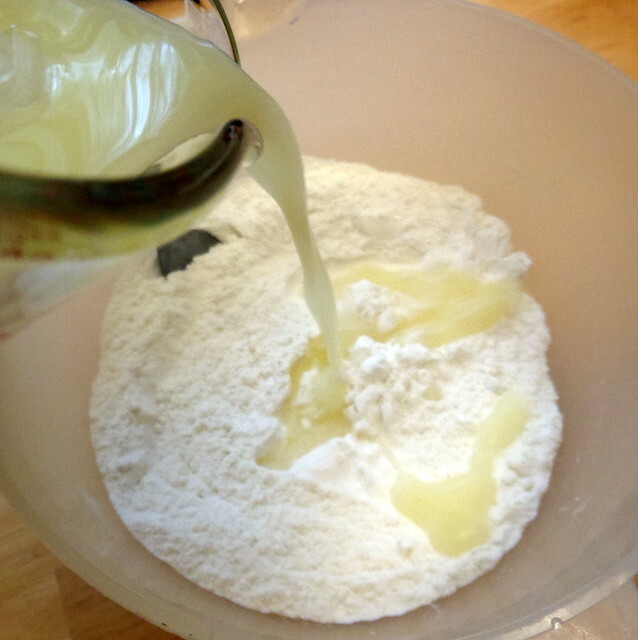 Mix together the bread flour and tapioca flour in a large mixing bowl. Dissolve the salt in the warm water. 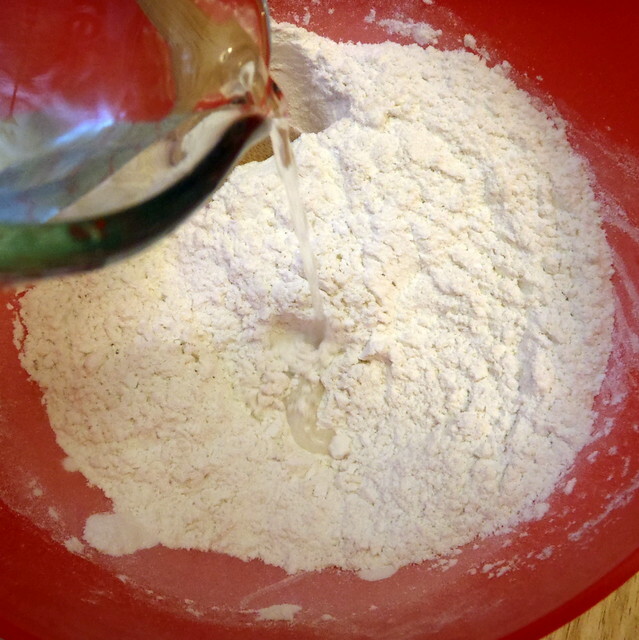 Pour about half of the salt water into the flour and mix with your hands. 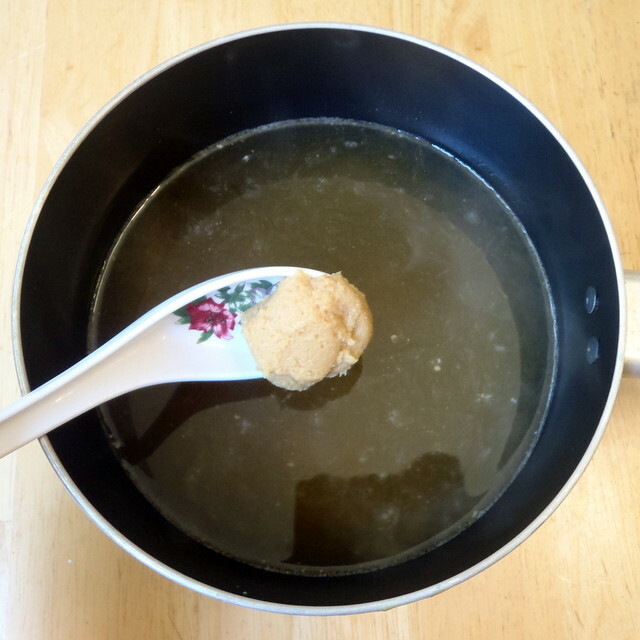 Add the remaining water, a teaspoon at a time, just until you can form a ball with the dough. 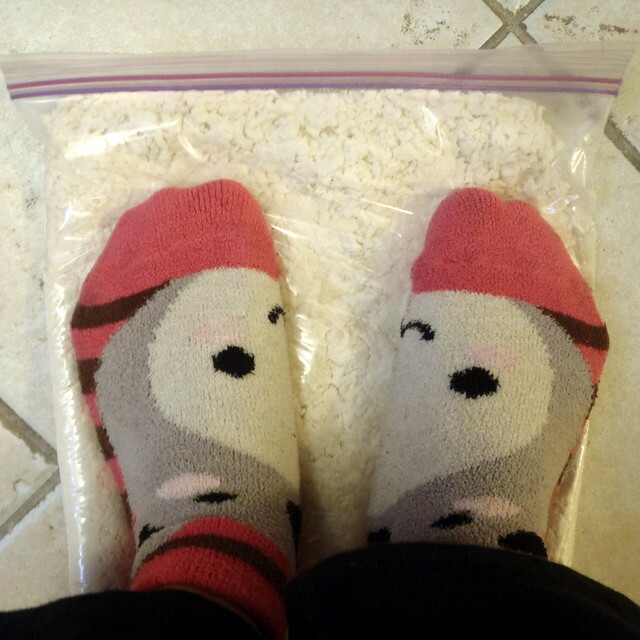 Remove the dough from the bag, fold it in thirds like a letter, place it back in the bag, and knead with your feet again for another minute. Repeat this process two more times. Let the dough rest in a warm place for 3-6 hours. Divide the dough in 4 quarters. Work on a quarter at a time, leaving the rest of the dough covered. 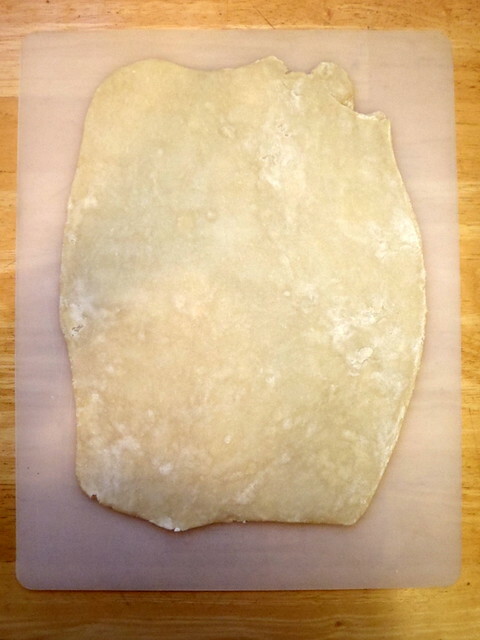 Use a pasta machine or roll out the dough on a floured surface to 1/8" thickness. Dust the surface of the dough with a little more flour and then fold it into thirds like a letter. 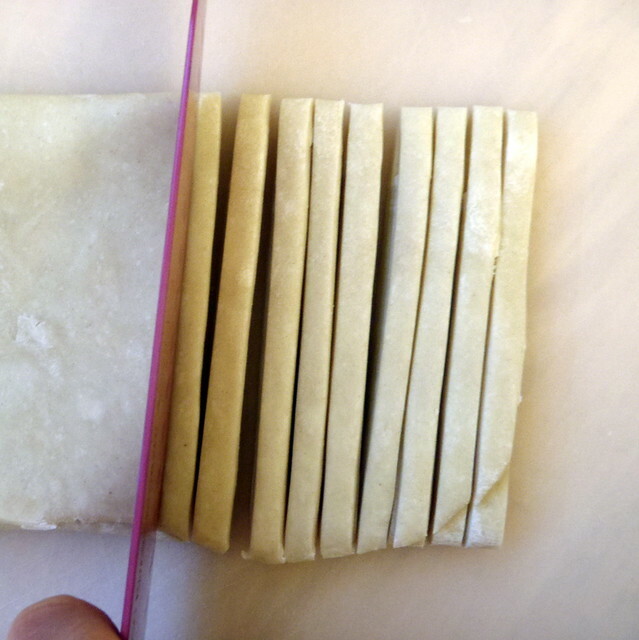 Cut the dough into 1/8" thick strips. 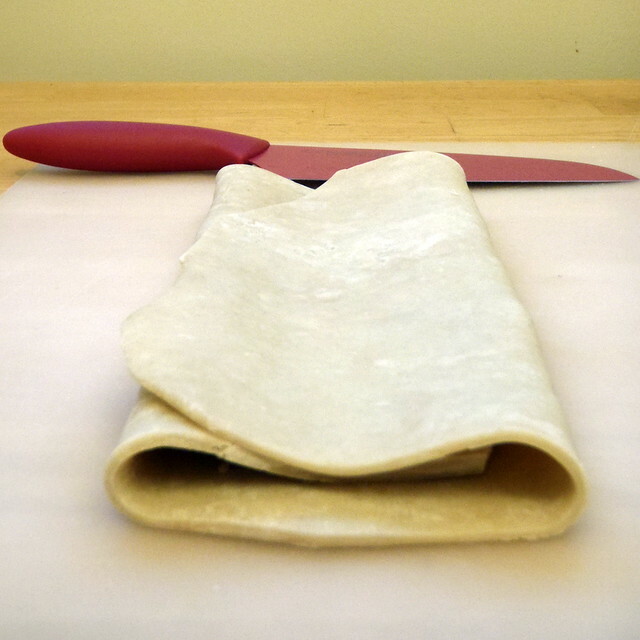 Keep the noodles covered while you work on rolling out and cutting the rest of the dough. At this point you can store the fresh, uncooked noodles in an airtight container (I used a Ziploc bag) in the refrigerator for a few days before cooking. Just make sure to toss them in enough flour to keep them from sticking to one another. As you can kind of see from my pictures, my dough was so dry already that I didn't need to add much more flour. Bring a large pot of water to boil and add the fresh noodles. After about 3 minutes, the noodles will start to float. Cook for another 2-3 minutes until the noodles look swollen. Drain and rinse with cold water. 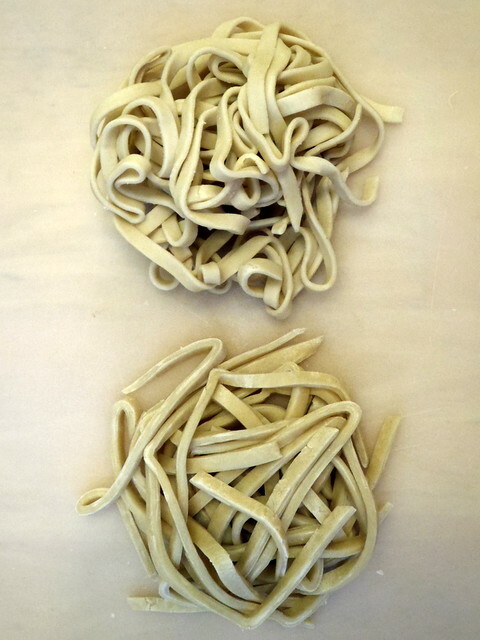 Above is a comparison of hand-rolled and hand-cut noodles vs. machine rolled and cut noodles. Can you tell which is which? 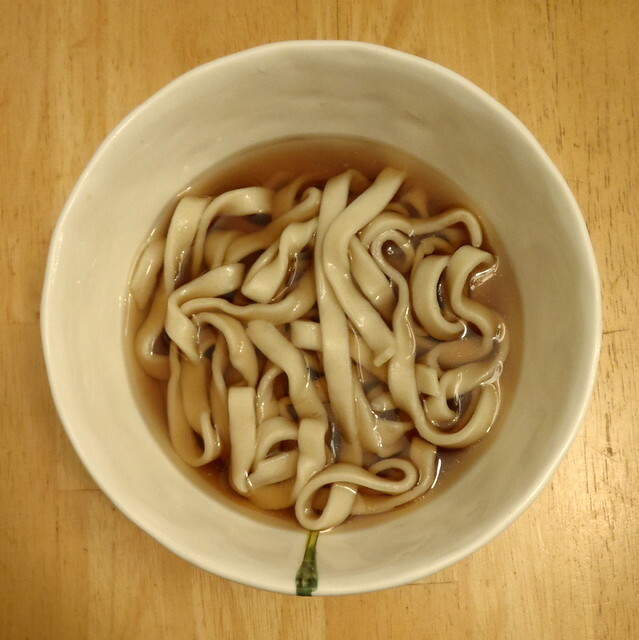 I like to eat my udon noodles in a dashi broth seasoned with a little soy sauce and mirin (about 2 teaspoons of soy sauce and 1 teaspoon of mirin per cup of dashi). Add whatever toppings you want: tofu, mushrooms, snow peas, carrots, etc. 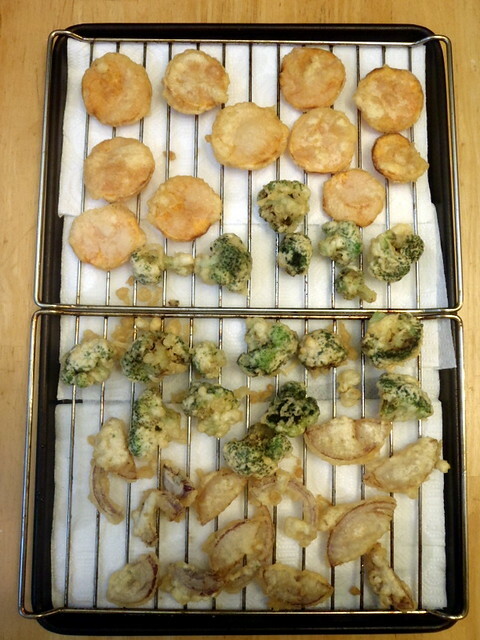 My favorite is vegetable tempura, which I'll cover in the next post! 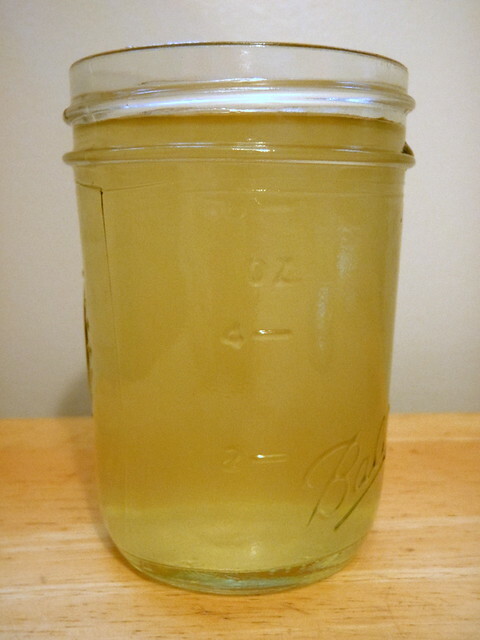 Now that we've made the ramen noodles, it's time to make some ramen broth! 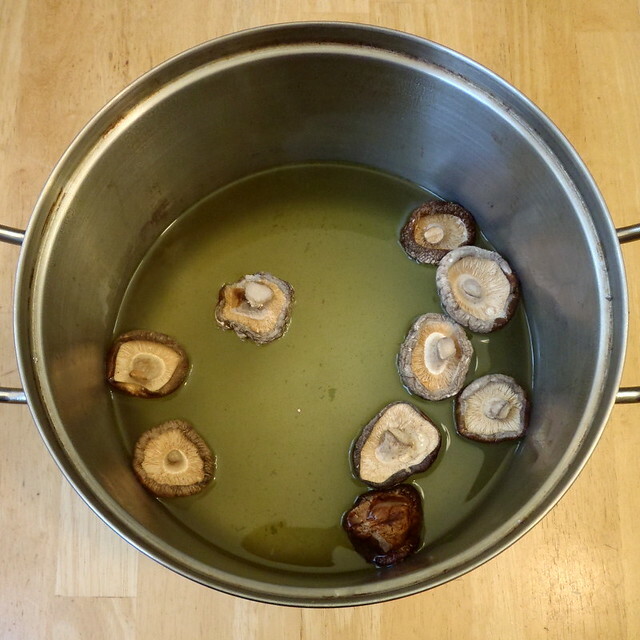 Some broths take hours if not days to make, but fortunately, it only takes a few minutes to make the broth for miso ramen. 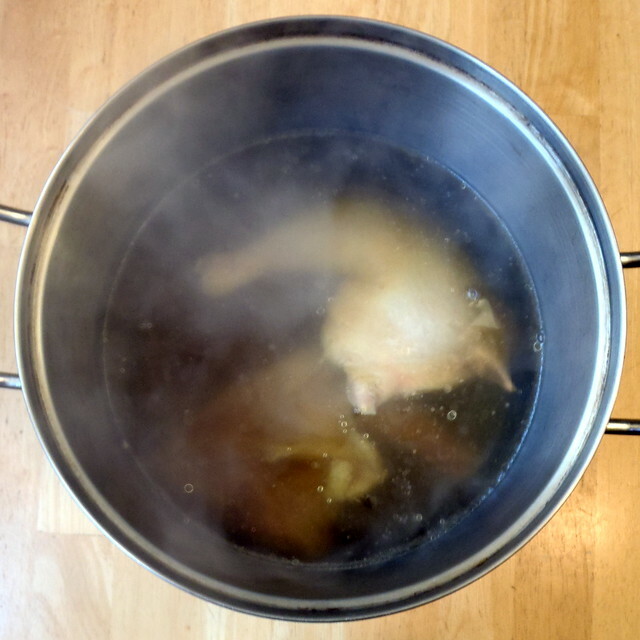 There's two ways you can make this broth: either add instant dashi and miso paste to chicken broth, or add chicken bouillon and miso paste to dashi stock. 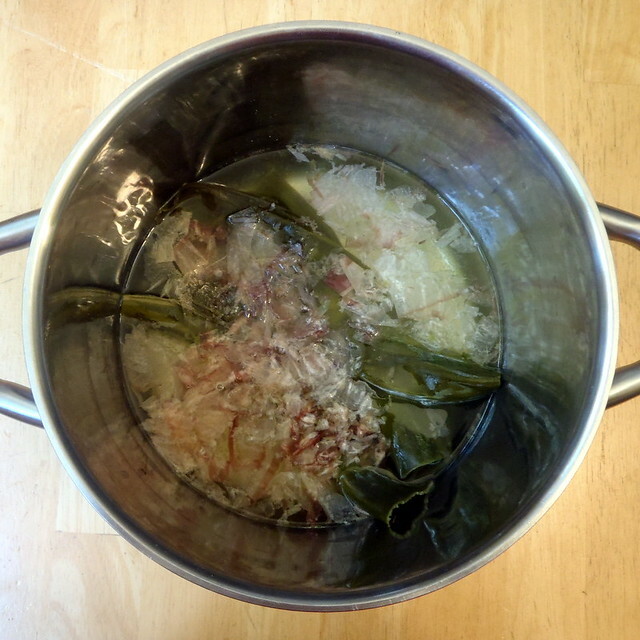 I chose to do the latter because dashi is a lot easier to make than chicken broth, and the two ingredients (kombu and bonito flakes) are shelf stable. 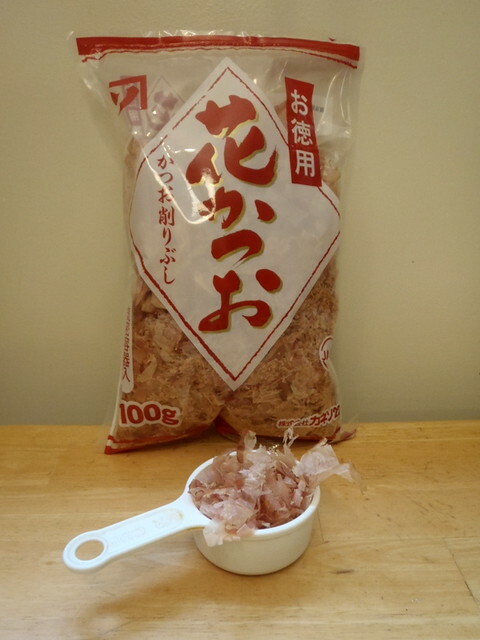 Kombu is a type of seaweed, and bonito flakes are made from smoked, shaved fish. You should be able to find both in an Asian grocery store, but I've also found them in the ethnic section of grocery stores. They both are very high in umami, which is why such a simple preparation can produce so much flavor. 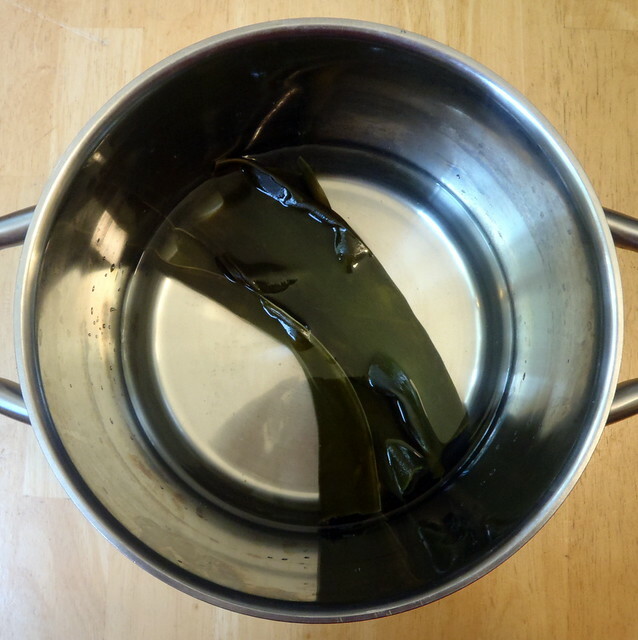 Place the water and kombu in a medium pot and let soak for 15 minutes. After 15 minutes, place the pot on medium heat. Just before it boils, remove from heat and sprinkle the bonito flakes over the surface of the water. After 3-4 minutes, strain through a fine mesh strainer. Now let's talk toppings: my absolute favorite is a marinated soft-boiled egg. 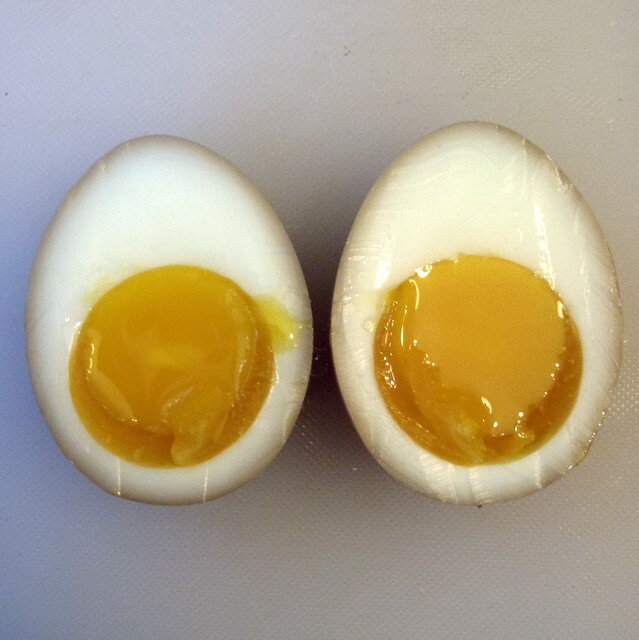 It's similar to lu dan, except the yolk is barely set, and the marinade only penetrates the outer surface of the egg. It took me a few tries to get it right because the recipe I was using called for the egg to be boiled for only 6 minutes, but my eggs were still too soft at that point. You want to cook it just long enough so that the egg white is set. If it's too soft, it's almost impossible to peel, which I found out the hard way. Eventually, through trial and error, I found that 7 and a half minutes was the ideal amount of time that I needed to cook my eggs to that point. 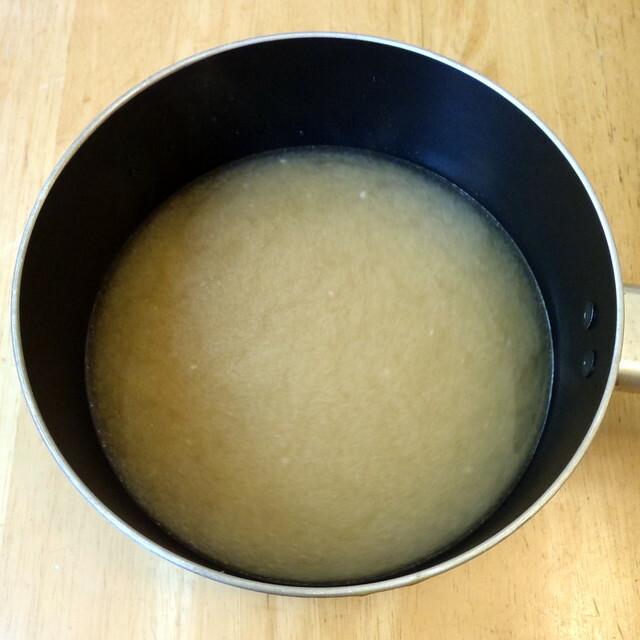 Combine water, rice wine, soy, mirin, and sugar in a medium bowl and whisk until sugar is dissolved. Set aside. 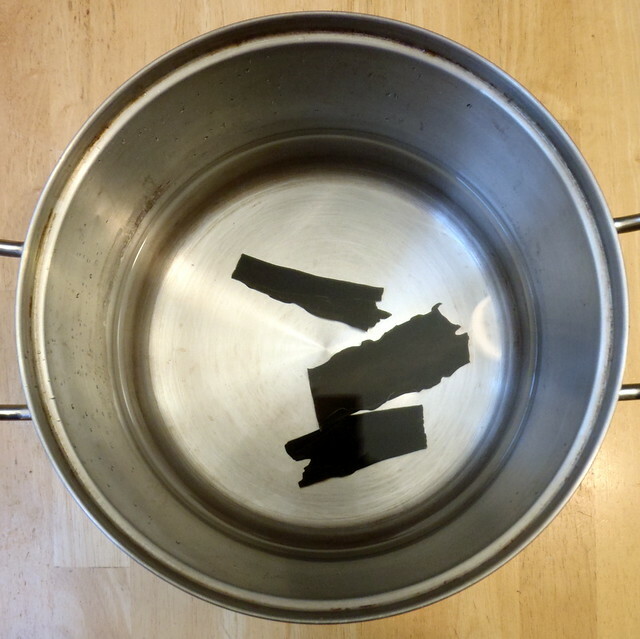 Bring 1 quart of water to a boil in a medium saucepan over high heat. 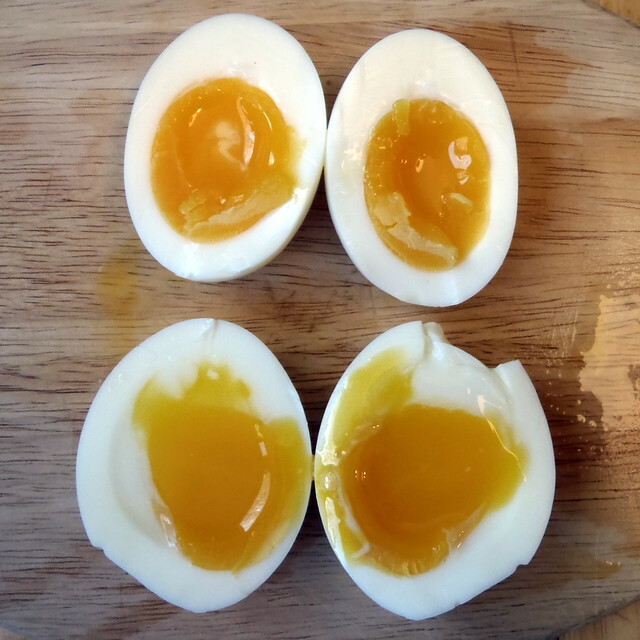 Carefully lower eggs into water with a slotted spoon. 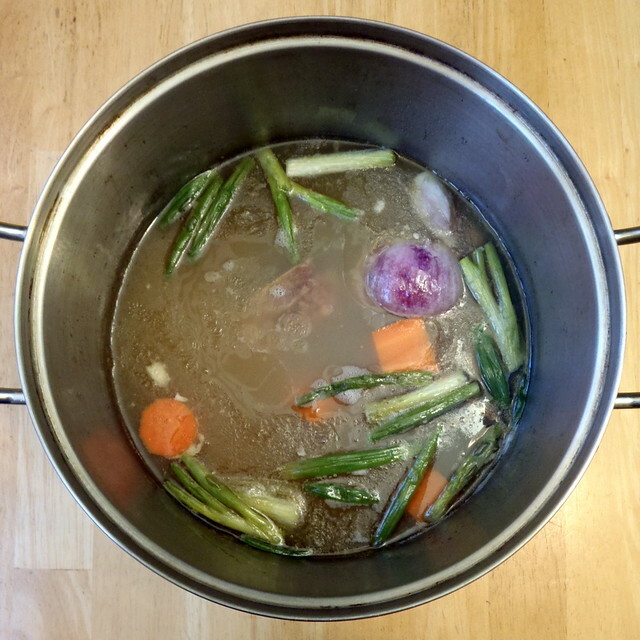 Reduce heat to maintain a bare simmer. 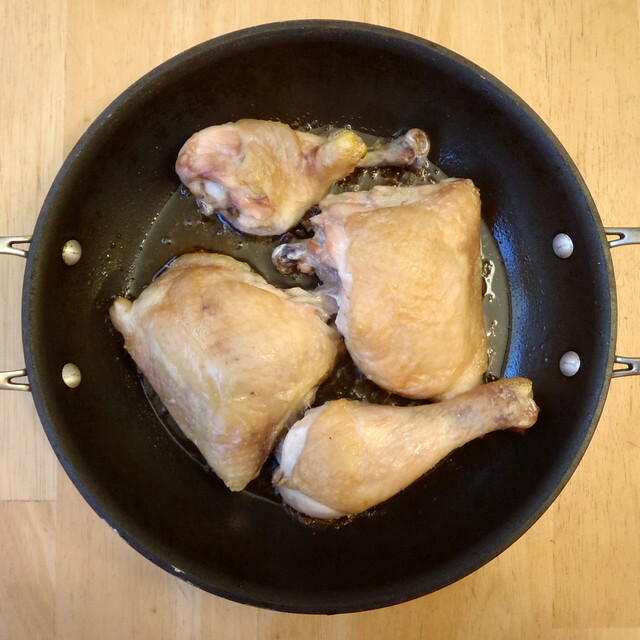 Cook for exactly 7 minutes and 30 seconds. 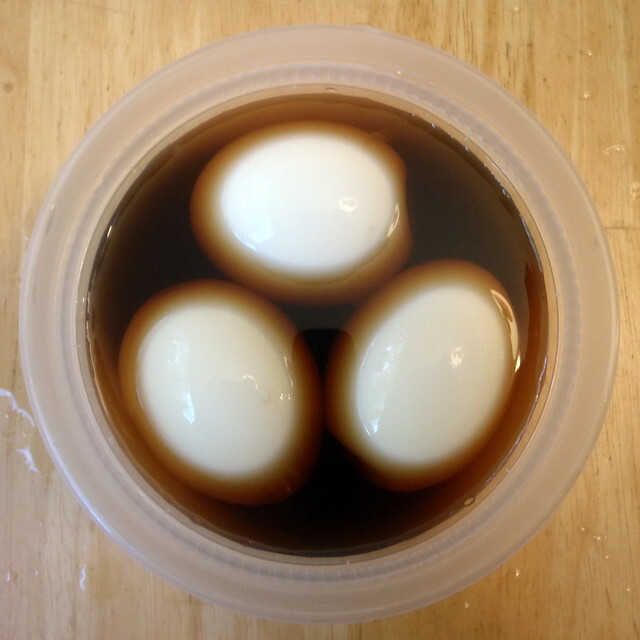 Drain hot water and transfer eggs to a bowl filled with ice water. Cool for 3 minutes and then carefully peel eggs (the whites will be quite delicate). 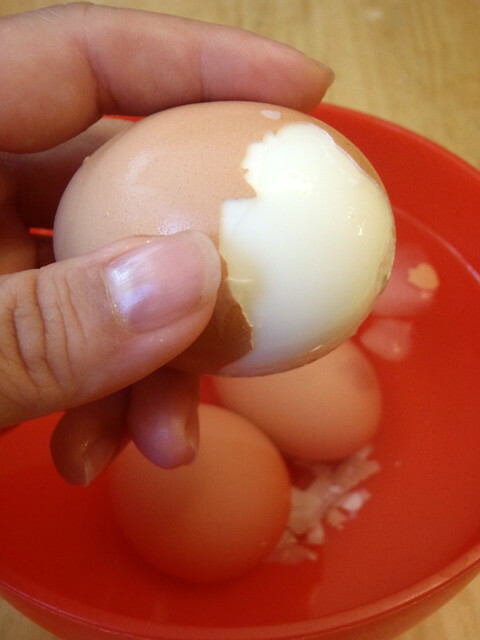 Transfer eggs to a bowl that just barely fits them all. Pour marinade on top until eggs are covered or just floating. 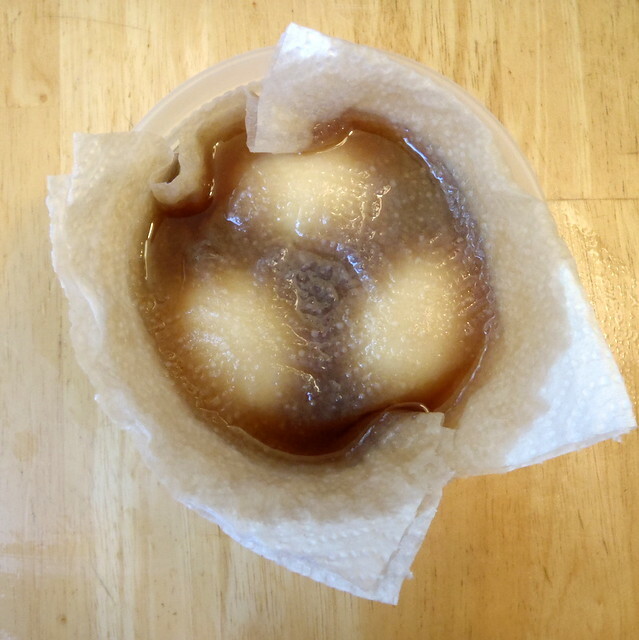 Place a double-layer of paper towels on top and press down until completely saturated in liquid to help keep eggs submerged and marinating evenly. Cover and refrigerate at least four hours and up to 12. 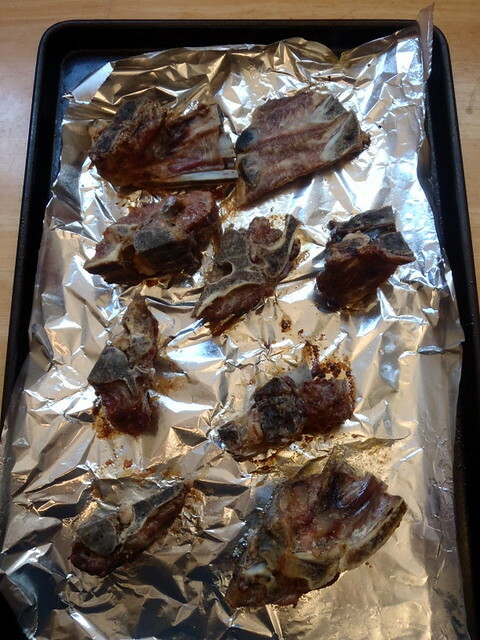 Discard marinade after 12 hours. Store eggs in a sealed container in the fridge for up to 3 days. As for the rest of the toppings, I didn't have any roast pork on hand, or else I would have used that, but I did have some fried tofu, which worked well with the miso broth. 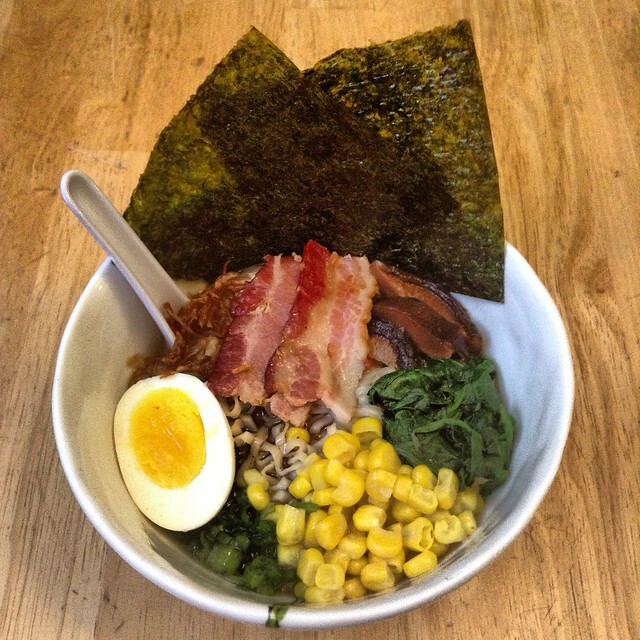 Other possible toppings include corn, bean sprouts, chopped scallions, nori, cooked spinach, bamboo shoots, etc. 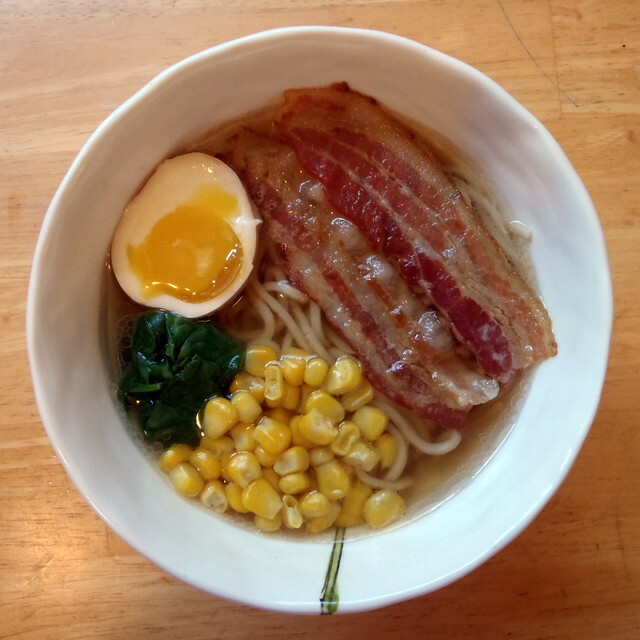 You don't want anything too strong to mask the flavor of the broth, but it's nice to have a few different textures in each bite. Add the dashi stock, bouillon cube, corn, bean sprouts, and fried tofu in a medium pot and bring to a boil over high heat. 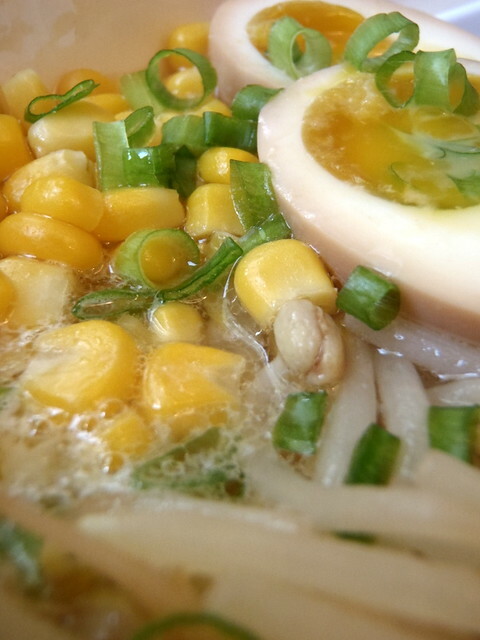 Remove the corn, bean sprouts, and tofu with a slotted spoon and set aside. Remove the pot from heat and add the miso paste to the stock. Stir to dissolve. 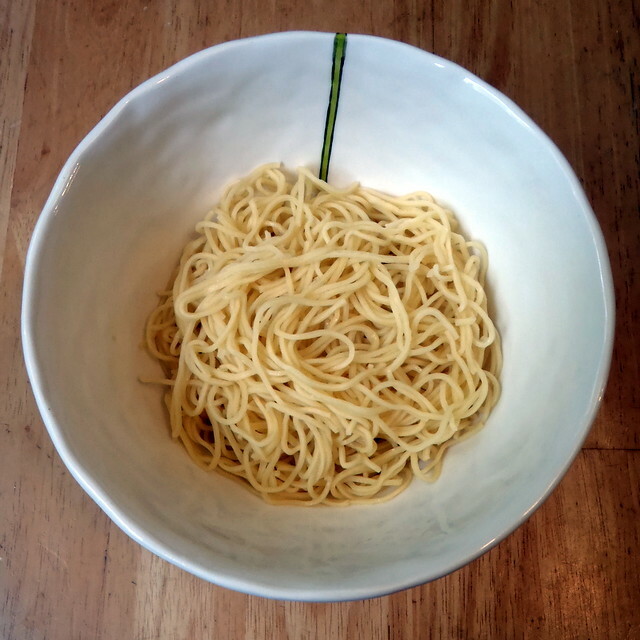 Split the cooked ramen noodles between two large bowls. Pour in the miso broth. 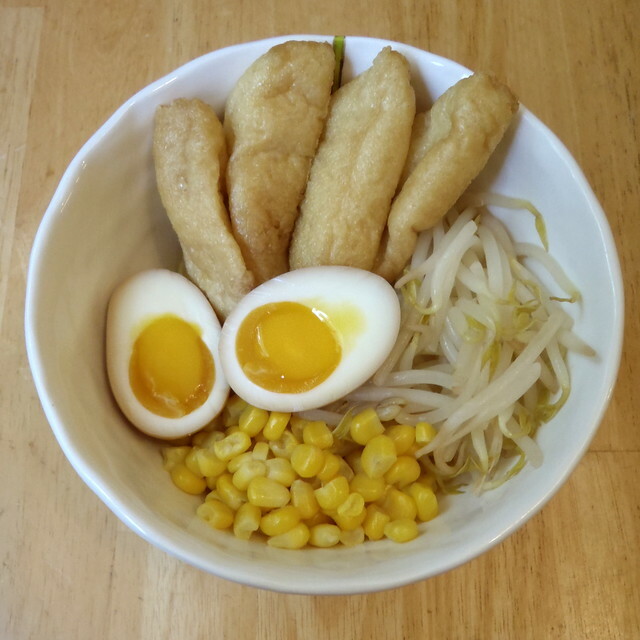 Top each bowl with half the corn, bean sprouts, fried tofu, and marinated soft-boiled eggs. Place two sheets of nori in each bowl and sprinkle half the scallions over each bowl. 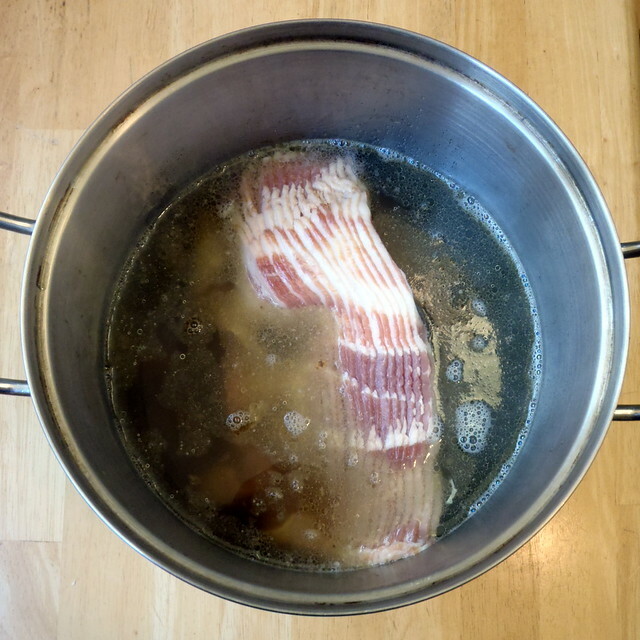 Next post: Momofuku Ramen Broth!